In 2014 I took a trip to Kenya with a friend. The experience is still very fresh in my mind and heart. We traveled to gorgeous places, saw amazing creatures of the wild, and met people who enriched our lives. I took a lot of photos and from time to time I still go back to browsing through them. Not too long after the trip, I read "Rules of the Wild" by Francesca Marciano, a story of Europeans and Americans living in Africa, in particular in Kenya. The story fascinated me but I found one particular passage so true, so touching, so moving. We often say that words cannot express everything but this little excerpt summarizes so clearly my little Kenyan adventure. Do you have a piece of literature that has captured something you experienced? Source: Rules of the Wild by Francesca Marciano, 1998. I find the creative process fascinating. For my fashion design work, I do a lot of research and test out many ideas before settling on the one I wish to develop and finally execute. A TED talk by Emma Rogan inspired me to take a little challenge: come up with an exercise and do it over and over during a set period of time. I decided to draw a new pocket for 50 days to arrive at a portfolio I could reference in my future design work. And what a fantastic experience! Creativity seems to flourish within constraints. Having to repeat the same task daily forced me to go past the initial idea, to examine shapes, finishes, treatments. The pockets, primarily for a front of a shirt or a back of pants, sometimes came easily to me. In a minute, my challenge would be done. Other times, I stared at the blank sheet of paper for a bit, or I even had to walk away and do something else, before an idea would come up. Bubble skirt is a must! I originally thought of designing and sewing a tulle skirt but on a trip to the fabric store, this lovely fabric caught my eye and here I am with a dreamy bubble skirt. Fully lined with an invisible zipper, it is a fun one to dress down (black tank top) or dress up (white blouse). Do you have a similar one? I recently saw two exhibitions that explore the experience of living in the US. They approach it from different points of view and through different media but I find them both worth seeing. As somebody who came to this country and established my life here, I often evaluate my experience and how it has changed over time. The National Portrait Gallery (NGA) has a photography exhibition called American Cool. While I love photography, especially black-and-white, I find the stories that go with each photo even more interesting. This exhibition searches for what defines 'cool' (an idea that originated in the 1940s) through explorations of lives of people who have changed the society and culture. The word itself is charged with energy and my experience with it is internal, rather than linguistic. I cannot really even find a word or a collection of words in Czech that would reflect what this word signifies to me and who I perceive as 'cool.' Check the collection out (open through September 7, 2014) and see what moves you. While NGA displays photos, the Phillips Collection presents about two hundred paintings that portray life in this country at an exhibition called Made in the USA (open through August 31, 2014). Starting with late 19th century, the paintings, arranged in rooms thematically, take a look at the artists' experience. I am drawn to paintings that explore life in the city and how a city has changed. Other rooms have works that focus on country side, migration and immigration, culture ... What is the message that comes across? It is that a vast variety of voices, opinions, and experiences, has affected history and thus our current lives. Light and music. Westerkerk Church, Amsterdam, Netherlands, 2013. The fashion industry is a field of creativity and wonder. The collections presented on runways for Fall 2014 offer tons of variety and new ideas but what caught my attention are looks that explore how fabric works on the body and around it. The traditional silhouette that hugs the body is often abandoned. Several designers show dresses that are not shy about fabric and plenty of it. I am fascinated by designs that 'live' on their own when the body is in motion. Designing on the dress form is one thing; being able to bring life to the garment is another. Here are three examples of dresses I like. Electric Feathers (white dress) explores how the width of a dress adds to the visual value of the garment. It would be lovely to see the design when the model is standing still; the drape on the dress must be interesting. Heohwan Simulation gives us an asymmetrical black-and-red dress - it has an edgy and future-forward futuristic feel. Chadwick Bell brings sparkle and lightness into play with the dusty pink dress. Making history. Diane Von Furstenberg, 1976. Vivid colors and interesting shapes and textures are some of things I look for when I travel. I love taking photos. Sometimes I come back from a trip, instead of a photo of that important building I aimed to see, my camera is filled with pictures of design details (door handles are fascinating! ), close-ups of food (ooh, the shapes and colors! ), and things with interesting patterns and textures (have you ever looked closely at a cobblestone street?). I took a trip to Paris in 2013 and wandered through the city for a week. During this time of visual overload my camera was put to work. Here are some of the lovely finds I came across. Can you identify all of them? For my design work, I identify an inspiration for each collection I work on and as Paris was the inspiration for my very first collection at the Academy of Art University, it remains quite special to me. I hope to go back one day to come across more magic. Aren't these colors amazing? Reading Terminal Market, Philadelphia, PA, 2014. Architectural treasure in tom ford's "a single man"
Do you ever watch a movie and end up loving the location where it is filmed? Fashion designer Tom Ford ventured into film-making with his directorial debut, "A Single Man," in 2009. I recently watched the movie again and, as one would expect, noticed a lot of details I missed the first time around. Ford's designer touch is noticeable throughout the story - from exquisite 1960s clothes, moments that feel like fashion magazine photographs, to the place where the movie's lead, portrayed by Colin Firth, lives. The house in Glendale, LA, is called the Schaffer Residence and is almost like a movie character on its own. The Schaffer Residence, now in private hands, is a gem. It was built by architect John Lautner in 1949. The interaction of the wooden/metal structure with its surroundings is well-balanced and the interiors are both airy and intimate. Wouldn't you want to walk through the house? Read a book in the living room? Or relax in the garden? If you wish to see more photos of this exceptionally beautiful house, take a look at Curbed Los Angeles. Coco Chanel, circa 1950, Paris. I am an aficionado of Mark Rothko's work. His abstract paintings show a deep understanding of colors, their relationships, and tell a fascinating visual story. Some paintings are light and communicate warmth; other highlight the darkness of one's mind. 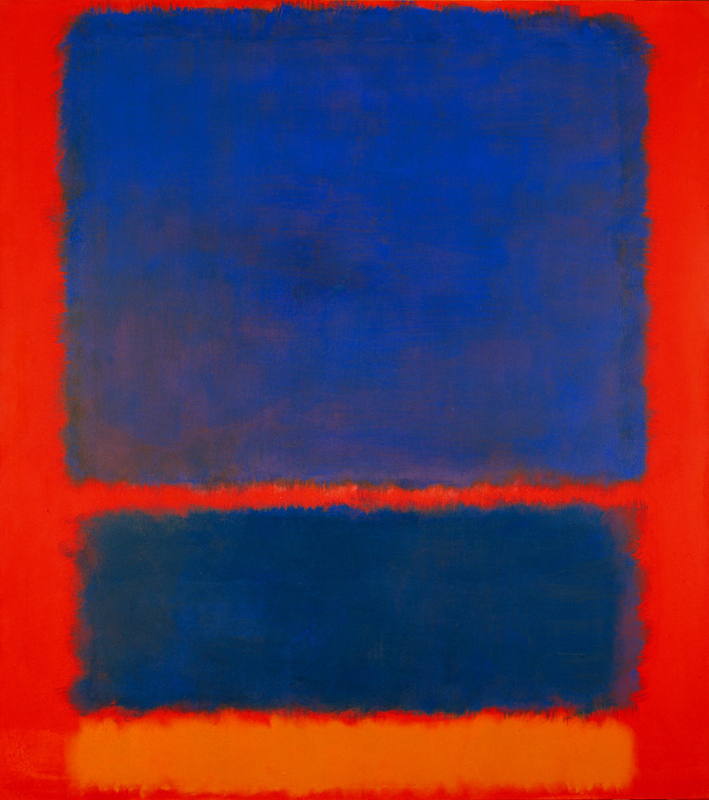 One of my favorite places to visit is the Rothko Room at the Phillips Collection in Washington D.C. This small room houses four works by the painter. Only 8 people are allowed in the room at the same time; one thus always gets a quiet moment with the paintings. If you are in the neighborhood, don't miss the opportunity to stop there. I like Rothko's ability to combine vibrant colors that otherwise would be just too much - he manages to bring about balance and intrigue. My favorite work, "Blue Orange Red" inspired a dress I made some time ago. I thought it would be fun to combine these strong colors and while sticking to a simple silhouette, to take a look at how little details can make the dress special. I gathered the shoulder and added a flared orange hem. To imitate the horizontal division in the painting, I inserted a vibrant red zipper on the back. Do you have a piece of art that inspired something you created? Fashion illustration is an area of illustration with many a specific requirement for the fashion industry. It is crucial for a designer to be able to convey his or her ideas when it comes to shape, fabric, and silhouette. And illustration is the tool to do it. If you are getting into the field or just want to improve your own style, many artists share their knowledge on YouTube. I find tutorials by Yelen Aye and Zyra Bañez particularly applicable to what I need to focus on. Check them out! going to Prague? Consider The Outskirts, Not Just staying the city center! But if you go, consider going over to Prague 6, the greenest part of Prague. It is a quick tram ride from the city's center and you will get so see the calmer (less touristy) part of the city. Take a look at the pictures below and see for yourselves! "Libocky rybnik" - the perfect spot for an afternoon picnic, a walk and relaxing while admiring the sky's reflection in the lake's surface. "Letohradek Hvezda" - a royal house built in 1555 in the shape of a star. They have great art exhibits and information about the building's history. Surrounded by several hectars of land, this is a gem. And, there is a lovely bakery - check out yummy Czech cakes and pies! "Rezervace Sarka" - named after Sarka, a mythical warrior-maiden of Bohemia, this is the best place for hikes and views of lush green forests. Anybody say 1960's hippie culture? That is indeed the inspiration for my collection for a class I am taking this semester, Fashion Design 4. This is a great topic to research: fashion, music, beliefs, politics ... An era of American history filled with color, creativity, and wonder. A total of 12 looks will target a woman living in a city but with a wild and deep love for nature and fresh air. Moving through research and design ... Will keep you posted of the final collection lineup! It has been a long and cold winter ... But Spring is here and I thought it would be lovely to design and sew a top to reflect the colors about to enter our lives. Here is a lovely lace top (mint green is so the color of 2014!) the back of which is the center of attention ... A bit of flare never hurts.